Pharmaceutical company Bristol-Myers Squibb (BMS) has recently revealed a restrictive commercial strategy for sales of its new direct-acting antiviral (DAA) hepatitis C drug daclatasvir in developing countries. This new generation of drugs to treat hepatitis C is giving hope to the 185 million people infected with the disease today, as these drugs are expected to improve treatment and provide significantly higher chances of cure. But the prices of these drugs are of grave cause for concern. Gilead’s sofosbuvir, the first DAA which received USFDA approval, is priced at US$84,000 per three-month treatment course in the United States, and nearly $95,000 per treatment when used in combination with another DAA, ledipasvir. These prices will hinder any attempt to scale up treatment of the disease. But studies have suggested that the cost to produce these drugs is just a tiny fraction of the price of the drug; sofosbuvir costs just $68 - $136 per treatment to produce. One of these studies, from Liverpool University, suggests daclatasvir could cost as little as $10 - $30 to produce for a 12 week course of treatment. BMS has not yet announced the price for developing countries for daclatasvir, but the company has announced that it will create a tiered pricing strategy for the drug. Tiered pricing is a marketing strategy that sets different prices for different countries, most often based on macroeconomic factors; the effect is that middle-income countries – where nearly three-quarters of the world’s poor, and over 70 percent of people with hepatitis C, live – are required to pay high prices that are unaffordable to treatment providers such as MSF, government health programs, and patients who must pay for medicines out of pocket. BMS also announced its intention to negotiate voluntary licenses – which allow selected generic manufacturers to market cheaper versions of a drug – but with a geographical coverage of only 90 developing countries. Restrictive licensing terms can prevent generic competition where it is needed most: the BMS policy could mean that many middle-income countries with a significant burden of hepatitis C, including China, Egypt and Ukraine, are excluded from access to more affordable generic versions of daclatasvir and will have to pay higher prices. The ability to produce or import generic versions of daclatasvir will be critical to significantly reduce prices of these drugs, as well as to develop or sell fixed-dose combinations that are expected to provide the best treatment outcomes for patients. Registration of daclatasvir in all countries will also be key; BMS has indicated that it does not have plans to register the drug worldwide, which will seriously hinder access in those countries where BMS chooses not register the drug. Finally, BMS has largely decided their plans in secret, sharing very few details on plans for registration, price and access ahead of the announcement, an approach that is reminiscent of industry approaches in the early years of the AIDS epidemic and unacceptable by any standard today. Details shared ahead of the announcement have been purposefully vague and BMS has not yet committed to publishing any licence agreement it signs with generic manufacturers in the future, or its tiered pricing structure for developing countries. BMS’ secrecy and very restrictive commercial plans for developing countries is of grave concern, given the medical importance of daclatasvir; studies have shown it to have high rates of cure when used in combination with other DAAs. Daclatasvir is also pan-genotypic, showing it is effective for genotype 3, which has proven difficult to treat with other DAAs and is highly prevalent among people living with hepatitis C in India and Pakistan. “Unfortunately, history seems to be repeating itself with BMS, who haven’t learnt from the company’s poor track record responding to the HIV epidemic; it is disappointing that BMS is choosing to lock out millions of people from gaining affordable access to daclatasvir, and will not commit to registering the drug in all countries that have a hepatitis C burden, even those that do not represent a commercial opportunity for BMS. “Once again, people in middle-income countries – where nearly three-quarters of the world’s poor, and over 70 percent of people with hepatitis C, live – are the ones left empty-handed. Affordable access to daclatasvir has been intentionally blocked from most middle-income countries, with BMS keen to extract as much profit as it possibly can. 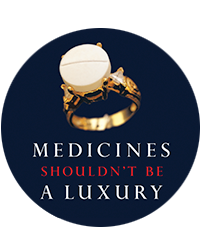 MSF hopes that excluded governments will take all relevant measures available under global trade rules and national patent laws to secure access to low-cost generic versions of these medicines. - Rohit Malpani, Director of Policy and Analysis, Médecins Sans Frontières Access Campaign.